This is the last issue of the series intended to appear before the adaptation of The Empire Strikes Back, with the start of that adaptation teased in the next issue box; however, the next issue is instead a fill-in story, with the adaptation pushed back to issue #39. With that in mind, this issue closes with an epilogue in which the remains of Crimson Jack's Star Destroyer, destroyed in issue #15, discovered by agents of Jabba, who helped bacnkroll Jack's acquisition of the ship. 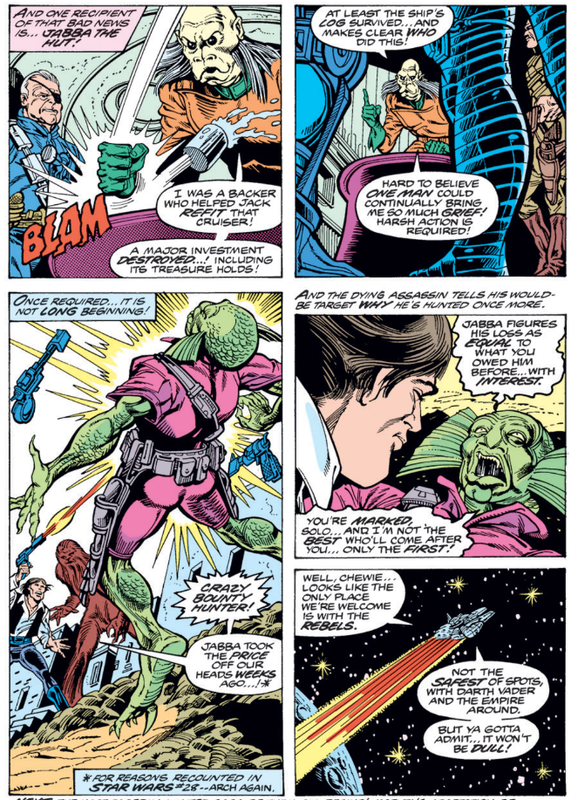 Angry that his investment has been ruined, he re-issues a bounty on Han, the person he considers responsible for the destruction of the ship, thus re-establishing Han as having a price on his head (after Jabba lifted it in issue #28), just in time for Empire (in which Han being marked for death is a fairly significant plot point). 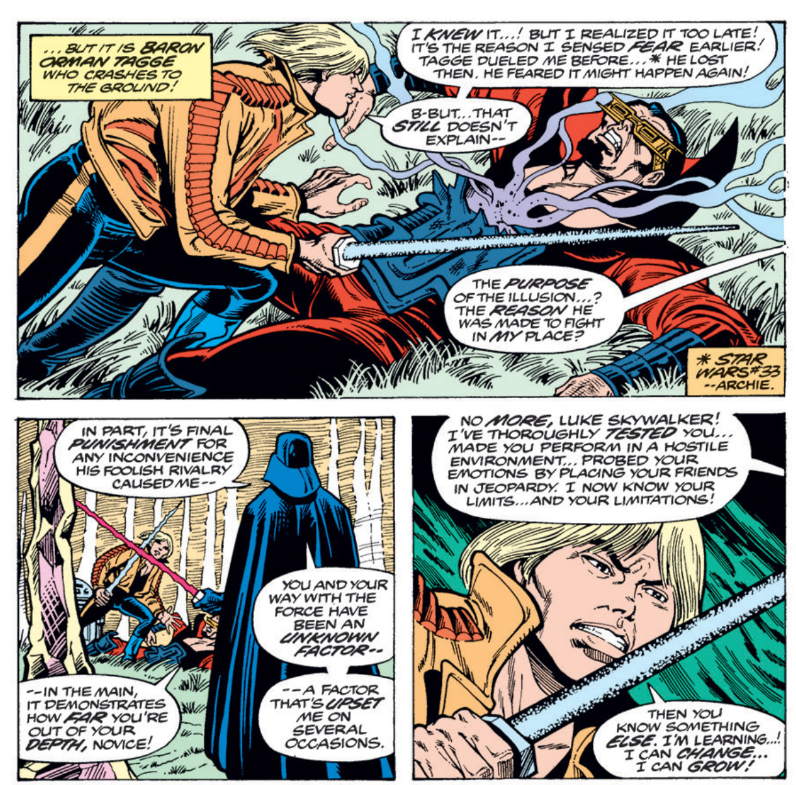 This issue seemingly features the first direct, saber-to-saber confrontation between Luke and Darth Vader, but in the end, it turns out to be Baron Tagge whom Luke is fighting again, his mind clouded by Vader to believe he's fighting him. As a result, Luke and Vader's battle in Empire remains their first direct physical confrontation as far as this series is concerned, a remarkable level of restraint on the part of this series' creators (or an indication of the strong hand of LucasFilm not allowing the pair to fight). The full scale of Vader's plan is revealed this issue, as Baron Tagge learns that part of Vader's rationale for empowering his sister was to taint the one member of the family whom the baron loved the most. Vader then forces Tagge to battle Luke, wherein Luke is forced to kill Tagge, leaving Domina as the remaining Tagge and filled with hatred towards Luke for killing her brother and Vader for arranging it. This then marks the actual, final end for Baron Tagge; Domina will return in a future issue. 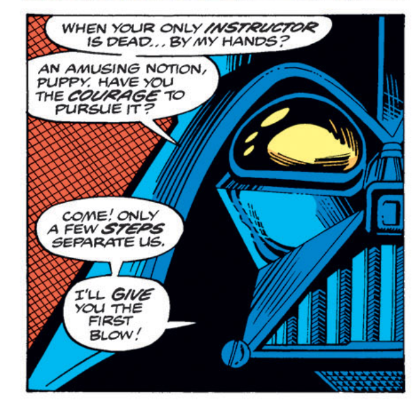 In addition to dispatching Baron Tagge, Vader also explains that he was hoping to test Luke and see how powerful his connection to the Force is. 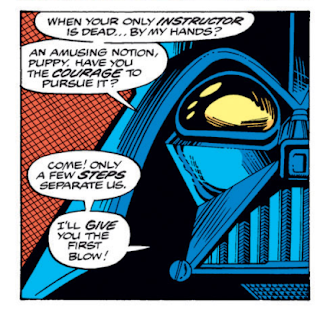 Vader notes that Luke's ability to grow in the ways of the Force are limited, given that Vader has slain his only teacher, which is possibly a tease of Yoda's debut in Empire. With Han and Leia working together to foil Baron Tagge, Han calls it a turning point in their relationship. And while it's seemingly a tongue-in-cheek remark, it is worth noting that thus far, we haven't really seen much development in their relationship, especially given that by Empire, they're tossing the L-word at each other. This issue functions as the conclusion to several different things, First and foremost, it is the end of the Domina Tagge/Sisterhood of the Circle storyline. 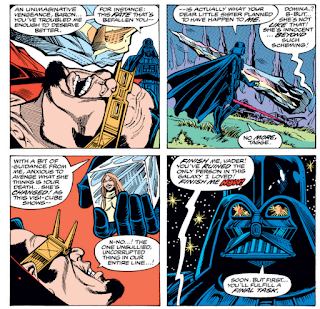 It is also the conclusion to the Baron Tagge subplot involving his feud with Darth Vader. 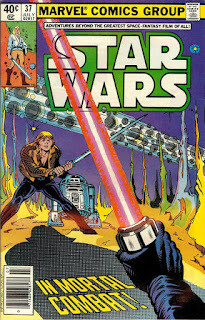 And it also functions as an end of sorts to the "New Hope" era of the series, that is, stories set between the original film and The Empire Strikes Back (next issue also takes place in that timeframe, but is a fill-in/inventory story; this issue was written with the expectation that it would lead directly into the series' adaptation of Empire). It works least well in that final regard. It positions Luke and Vader (somewhat) for their confrontation in the film, and if we're being charitable, it might be teasing the introduction of Yoda as Luke's new teacher in the ways of the Force. But it's most direct bit of setup, re-establishing Jabba's bounty on Han, while drawing on the existing history of the series to its credit, reads as very tacked on, as though Goodwin wrote this issue, then read the film's script and realized he needed to restore that particular status quo (or was told my LucasFilm). As it pertains to both concluding the immediate story and the long-running Tagge family drama, this works much better. The Tagge drama in particular has some delicious ironies to it (with Vader motivating Domina via the "death" of her brother, giving her greater power in the process even while spoiling her in the eyes of her still-alive brother, all because death is too easy a punishment for the baron), and while the baron is ultimately bested by Vader (by proxy of Luke), Domina remains a going concern. It's a strong end to a strong story, and while the Tagge family drama hasn't been present in the series since the onset of original stories, it does represent the longest running, most-sustained narrative thread thus far (even beyond more obvious stuff like Luke's training in the Force), and thus its fitting that it comes to a close just as the series prepares to shift in an entirely new direction. 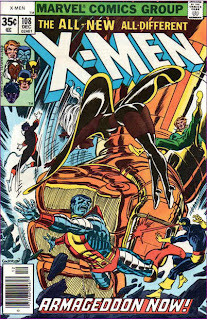 A pause before Empire, drawn by Michael Golden. Nice wrap-up for this great plot line; re-reading it a few years back I realized it's actually better than I remember it as a kid, which is always a pleasant surprise. 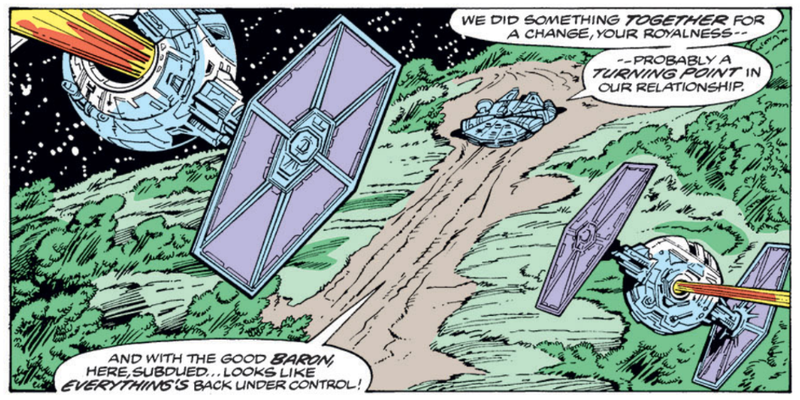 Many kudos to Archie Goodwin and Carmine Infantino for a still-worthy addition to the Star Wars mythos. Looking forward to the ESB reviews! This was really quite good. Han in particular, but all the characters really, are on the whole written very recognizably as we know them from the screen. And minus the obviously tacked-on last bit the plotting’s nicely done as well. That epilogue sure is sloppy. I'm still amazed Goodwin got approval from LucasFilm to pay off Han's bounty in the first place. 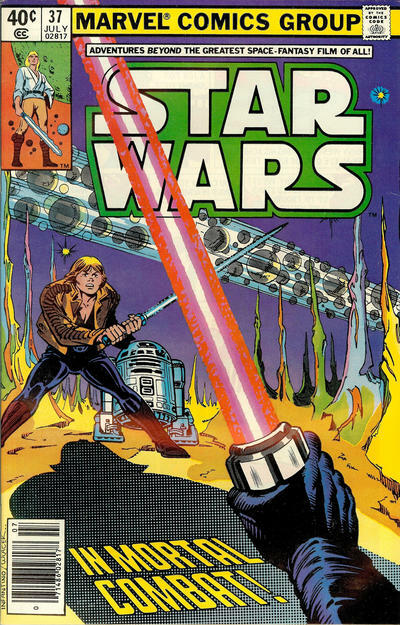 It occurs to me that somewhere right around this time (shortly after the theatrical release of EMPIRE), Goodwin and Al Williamson began their run on the STAR WARS newspaper strip. 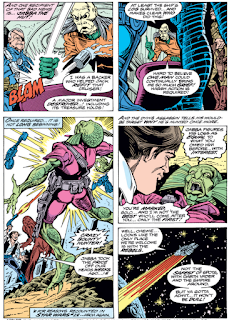 Though never identified as a direct continuation of Goodwin's work in the comic, it kind of is: the strip never contradicts anything Goodwin wrote in the comic, and it continues with adventures set between A NEW HOPE and EMPIRE, but with the benefit of hindsight, Goodwin is able to fill the gap much better. 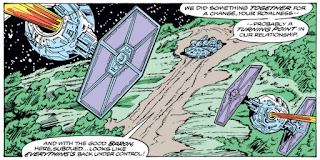 He picks up his old thread of the Rebels seeking a new base, and even has a saga near the end where they discover Hoth and finally depart Yavin IV. Taken all together, it's a nice, continuous run of "Archie Goodwin's STAR WARS". Pretty cool. I wonder if Goodwin slipped the Jabba thing past LucasFilm back in the day? I have no idea if, at that point, they were approving scripts issue-to-issue, or just handing out vague restrictions and guidelines in general. I know Dark Horse reprinted some of those comic strips packaged into single issues (and then trades), but I'd love to see Marvel (who presumably now has the rights to them all again) put out an Epic (or a nice hardcover series, like w/the Spider-Man strips) that comprehensively collects them all, in order. Then 2017 is your lucky year -- there's a ghost listing on Amazon right now for a STAR WARS LEGENDS EPIC COLLECTION: THE NEWSPAPER STRIP Volume 1. No idea if it will contain all the strips in chronological order or whether it will be the original strip format or the beautifully rearranged and recolored comic book version Dark Horse did in the nineties with the help of Al Williamson, but one way or another, it's coming...! "Archie Goodwin was an important comic book writer and editor for Warren, DC, and Marvel. He was born in 1937 and died in 1998." Is this an excerpt from some fourth grader's book report on the guy? It's bizarrely stilted and simplistic. Whomever gets paid to write that filler info on Amazon is getting paid too much. I'm going to guess the book will probably be a collection of the stuff that Dark Horse already had reformatted (and in some cases, added on to w/new art), just given the dimensions of those issues relative to the comic strip. Which will be nice to have, but I'd still like to see a comprehensive reprinting of all the strips, in their original format/layout, which would probably require a larger, differently-sized book.